A shopping-happy lurker appears! And a question. Warning! A LOT OF PHOTOS! Keep on collecting and thanks for looking! Hey everyone, I updated my sales with new photos, a new thread, and new merch! 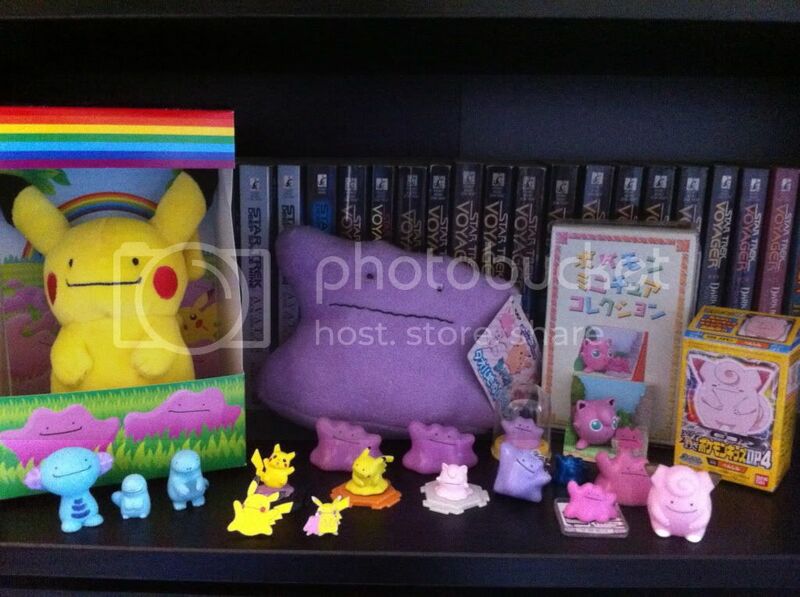 I addded some Zekrom/Nobunaga items, Eeveelution plush and clearfile among other things so come check it out :) I am toning down my collection to desperately try and keep it at one shelf so please come help me out! Collection Reduction Auction and other odds and ends. OK so the time has come, and decisions must be made. I love my dittos, and I am keeping some, but a good number of them must go. Little sad, but it's for a good reason. Thank you to everyone who helped me get my dittos, I really do love them but there are plenty of pokes out there to get! Please wait for Threads before bidding, Thanks! after the auction ill be updating it to only show what I still own. Hey guys, this is my first and last reminder for my on-going auctions for Lucario, Team Rocket and Weavile zukans, a Lapras swing charm, and a Diamond/Pearl Pre-Order figure. Most are near their starting bids. Auctions end Saturday 5 May, 8PM EST. Click any of the pictures to proceed! Less than 5 hours left to bid on the Flareon zukan piece and gold/silver Espeon & Umbreon Chou Gets! I also added an Espeon Chupa Surprise figure to my sales. C: I don't really know how much they're going for at the moment, so feel free to haggle on this one. x') Click the pics to visit my sales/auctions! Happy bidding! First sales post since I moved into my new apartment! :O Check it out! All purchases have been mailed between 5/9 and 5/11! Does Anybody Have A Bayleef Plushie? After watching the little arc in the Anime where Chikorita evolves, and then runs away after Ash was being mean to her. It makes me want to have a plushie of her. I hope someone has one, but they might be rare. Long Time No See and SALES! I rarely ever make posts here, but I'm wanting a few things! If you want to trade, and your item is worth more, I am also willing to add money to a trade. any items that aren't traded for will end up in a sales post sometime later! New Gets! + Something Awesome! Hello PKMNcollectors!!! Today I bring you an awesome update! I'll be going to Japan in a few days for study abroad program for 3 weeks. I'll be in Matsuyama for most of the time and then in Tokyo for like 2 and a half days. As i was thinking about my trip i wanted to ask if any of you live or have been to Japan and know the local or hot spots of pokemon shops around those cities. this would really help me find pokemon merch and things to bring back home from Japan. i mean who doesn't want to get pokemon merch from Japan?! I'm putting some more items from my collection up for sale to help pay for a very big grail item of mine I bought last weekend. Click the link below the photo to be transported to my sales. Thanks! Sales permission granted by lineaalba in May 2010. Hi, guys! I come to you with...yeah, you guessed it. Another question! So I moved to a new town not too long ago, and one of the things that I was desperately seeking out was an anime store like the one in my old town. Much to my shock, I found one at the mall! Unfortunately, I saw a lot of things in there that were bootlegs, but I saw a few that may have been legit and I was hoping you guys could help me identify which ones are okay to buy. I've already checked out the bootleg guide, but... I could barely tell the difference when they were next to each other. So I was wondering if I could get some assistance here. 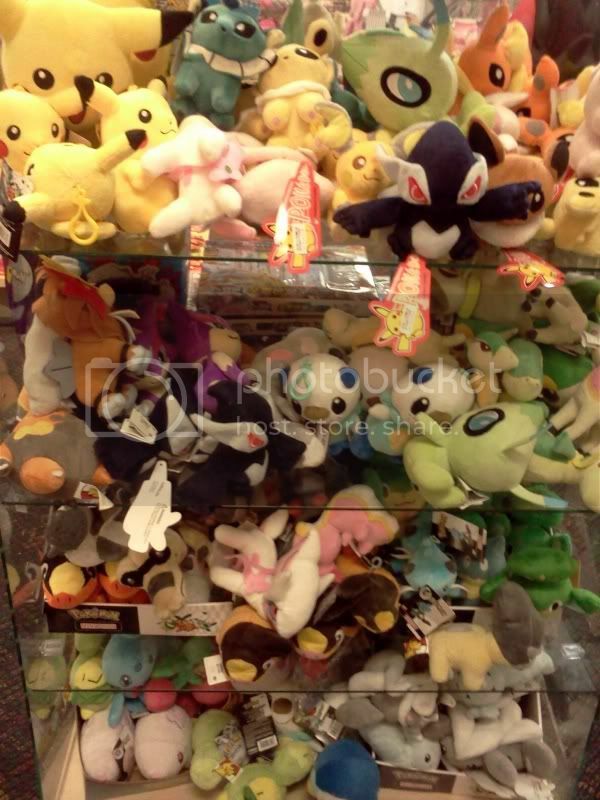 This is the shelf with all of the Pokemon Plush on them. I also made a more organized and nicer wants list~ with pictures!!!! This is just a lightning-quick, short-ish post. My inner perfectionist is flinching at this because I usually want to put more work into a post...but I dragged it away into some dark recess of my mind. XD I'm too excited to care! I just wanted to show off my newest plush, darnit! He arrived this afternoon. As soon as I heard the doorbell, I took off downstairs like a shot. I had been looking forward to receiving this plush all week! Here he is! He's a big old glorious FLAWLESS Giratina plush! I love the way his head is tilted - it makes him look almost cocky. More instagram photos under the cut! Finally, I also wanted to show an outfit I made for Prince Aster, my Snivy I got at the BW tours. That's all for today! Thanks for looking through! FIRST AND FINAL REMINDER! ARTICUNO ZUKAN AUCTION! Just a heads up that my Articuno Zukan auction will be ending in a few hours. The bids are still low, so if you are interested now is a great time to pick up this gorgeous piece for your collection. =) The link can be found under the picture! Gets + Sugimori auction reminder! 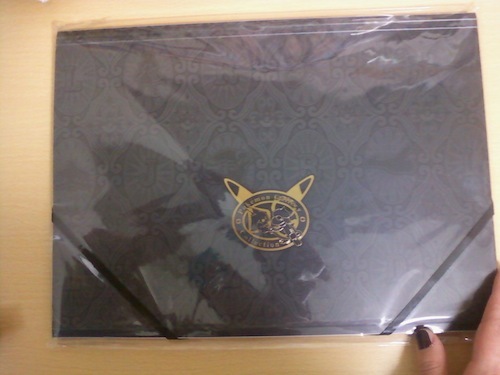 Received sales approval from denkimouse sometime around 2009. Its got less than a day left now! Also I do always try and make my posts a bit less boring. How crazy are you guys about collecting flats/stickers of your collection Pokemon? I'm just INSANELY crazy about it, i'll pay un-godly amounts for flats i dont have, Ill buy massive sticker sheets for just 1 sticker i need off of it xD Ive had a recent addiction to browsing foreign Ebay sites for flats i dont have.